Way back in May I made this quilt top as part of the 2018 Pantone Quilt Challenge. This year's Pantone color is Ultra Violet. 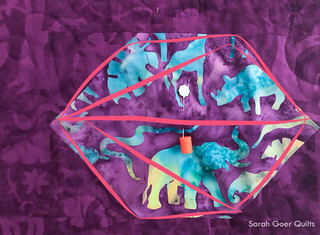 What a fabulous excuse to make a purple quilt! I opted for a version of my All About Angles. 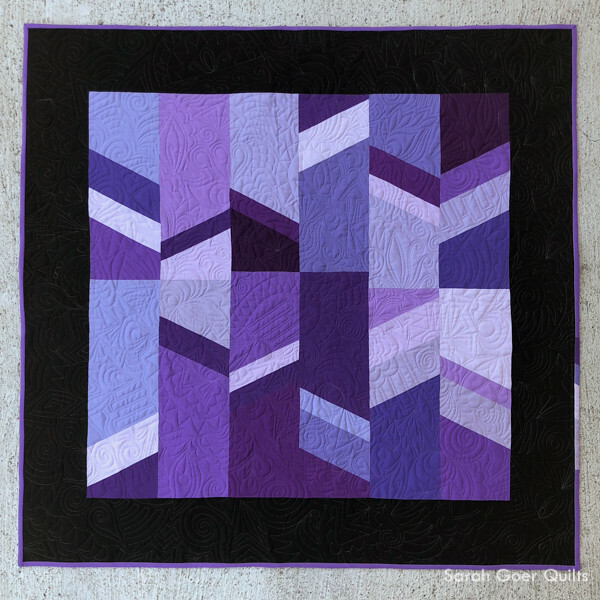 It was so great to see what everyone did with Ultra Violet for the challenge, which was judged in three categories: Quilts, Mini Quilts, and Just the Top. I'm honored to have received the Judge's Second place prize in the Just the Top category of the challenge. But then my quilt top got set aside for other projects. I definitely need an external deadline to finish a project and once I decided that I wanted to finish this up to submit to PIQF I had a firm August 28 deadline. 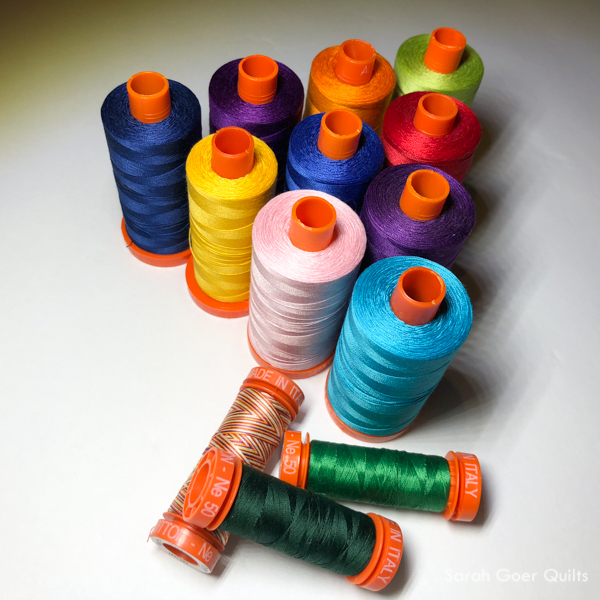 My Aurifil Artisan package included monofilament thread, something I have never used and was excited to try. 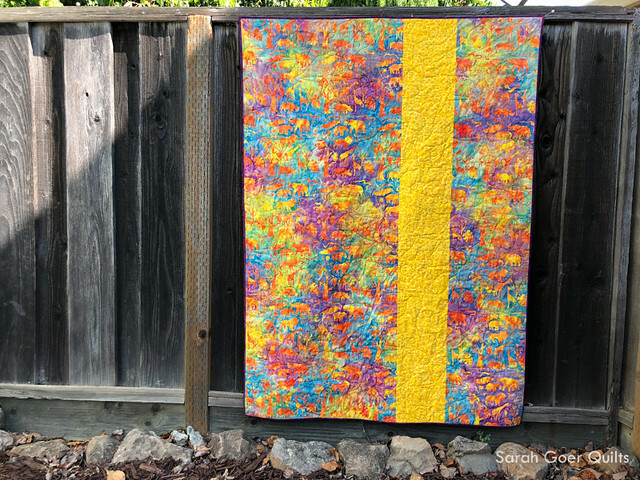 At some point I got it in my head that I wanted to do allover graffiti/improv free motion quilting for this quilt, but I wasn't excited about using a cotton thread in a color that would distract from the piecing in this quilt. With a variety of values including the black, I knew that no matter what thread color I chose, it would get lost in some sections of my quilt. At some point I decided that this would be a great opportunity to try out monofilament thread. I opted for the clear Aurifil Monofilament and did I little reading online and an informal IG survey for monofilament tips. I feel like monofilament had gotten a stigma in my mind for being hard to work with. Mostly, it was a dream. I wound the first bobbin only halfway at slow speed. I quilted until I ran out of bobbin with no thread breaks and no trouble. Then I rewound the bobbin with... more thread. Not quite full, but way past halfway. I had many problems. These problems went away as soon as I wound a new bobbin no more than halfway. So my quilting... first inspired by Karlee Porter's graffiti designs, I have a small tool box of motifs that I include in my FMQ mash-up. These include spirals, paisleys, arrows, buildings (that's what I consider the rows of rectangles), and leaves. You can see these dating back to my first graffiti quilted projects, the Schnitzel and Boo mini swap quilt and R's Pattern. 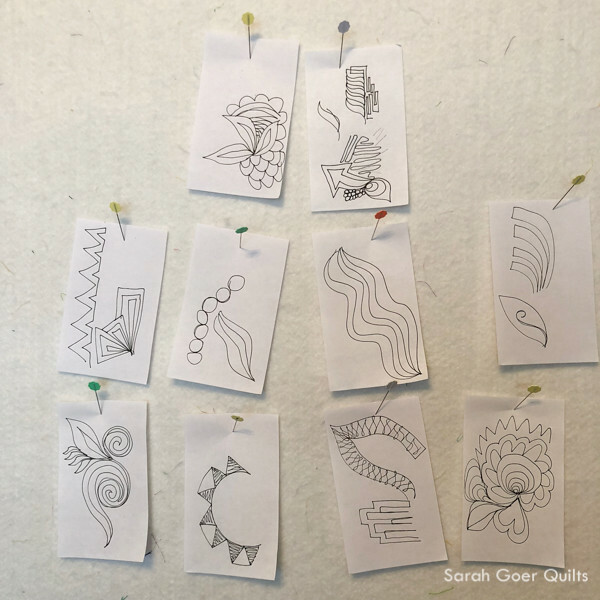 Now if I'm doing some FMQ mash-up quilting I peruse the IG hastags #graffitiquilting, #wildquilting, #flowquilting, and #freemotionimprov and look for motifs in the mix that aren't in my repertoire. I like to practice on paper to develop a bit of muscle memory. This go round I made short little sketches of interesting motifs that I wanted to work in. I pinned these up on my design wall to have a visual reminder. This helped when I felt I was being too repetitive. It allowed me to just look up and be reminded of what else I knew how to do. This technique really helped me and I prefer it over my past strategy of post-its on many pages of my FMQ inspiration books. I knew I wanted a purple binding. 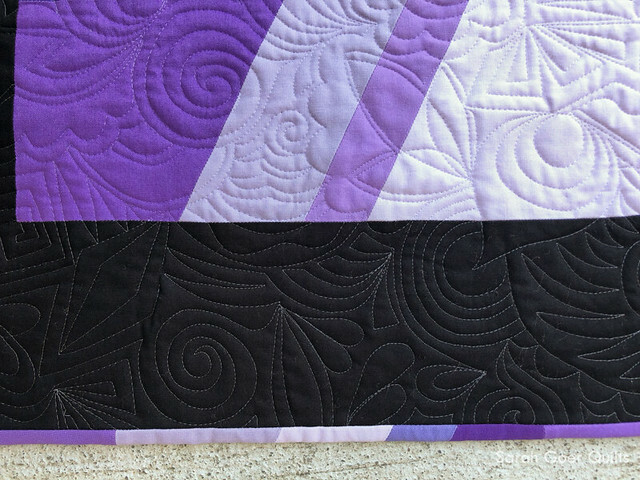 I really wanted to make it scrappy with the purple solids in the quilt top, but due to time constraints I opted for Kona Bright Peri for the binding. I used one leftover unit from the quilt top to include a pieced section. 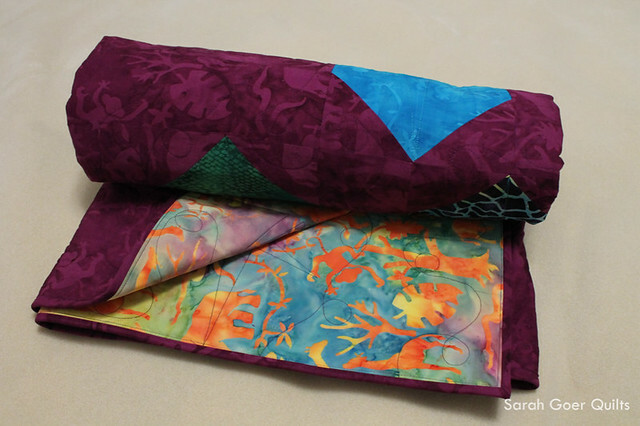 I was glad to carry more of the colors into the binding as well as the same angular piecing seen in the quilt top. This section is on the lower right edge of the binding (shown sideways here). 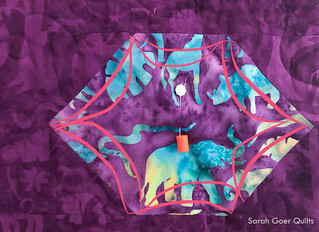 I backed my quilt with a purple print from my stash and attached my label before quilting. Most, if not all, of my purple solids came from the Kona Lavender Fields bundle. It finished at approximately 33" x 33". I'm so pleased to have my quilt completed, and finished in time to submit to the PIQF Quilt Competition in their wall quilts division. (It was a little too small to be submitted to the Modern Quilt Competition.) 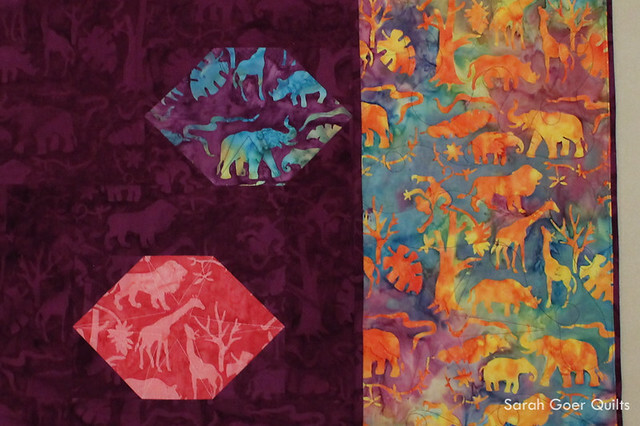 I also submitted Modern Batik Scrappy Squares in the Modern Competition. Notifications will be out by mid-September. To avoid trouble with spool unraveling, try a mesh sleeve or a thread stand. If using monofilament in the bobbin, only fill the bobbin halfway (or less). Aurifil recommends you hand wind your bobbin. If winding by machine, wind on slow speed. Use a new size 90/14 needle. Keep a piece of blue tape near your machine to stick the trimmed bits of monofilament to so they don't end up all over. Looking for inspiration? 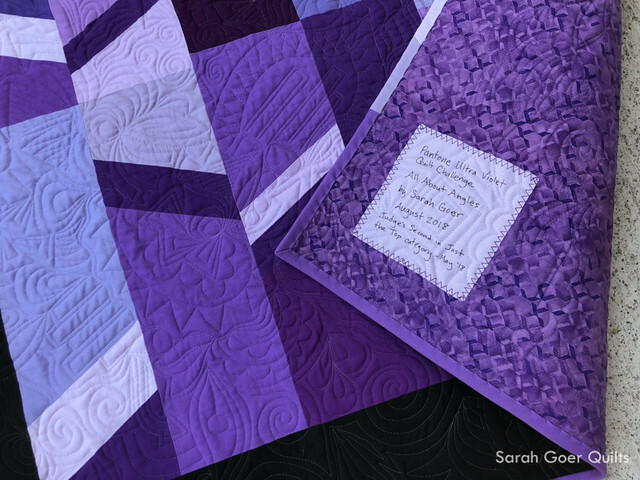 A couple books I love for free motion quilting motifs are The Ultimate Guide to Machine Quilting, Machine Quilting With Style, and 365 Free Motion Quilting Designs. I'm linking up to Needle and Thread Thursday and TGIFF. This post contains affiliate links. Following these links will NOT affect the price you pay. Posted in Quilting. 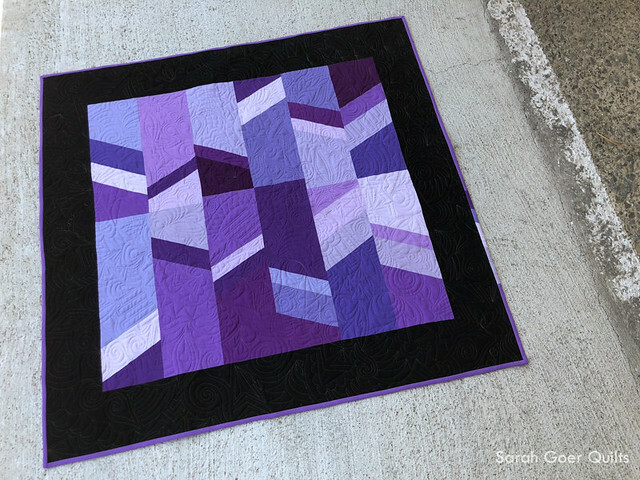 Tags: all about angles, finished quilt, FMQ mash-up, free motion quilting, planned improv, purple on August 30, 2018 by sarah. Welcome to my stop on The Great Outdoors Blog Hop. 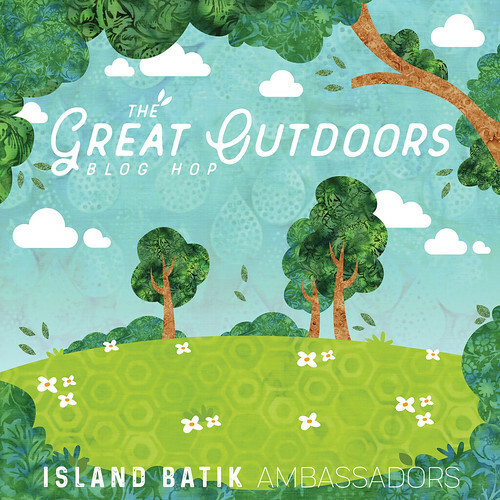 This hop features projects made from the Island Batik Ambassadors with all of Island Batik's newest fabric lines. If you see something you like, check with your local shop now to see if they are carrying it. 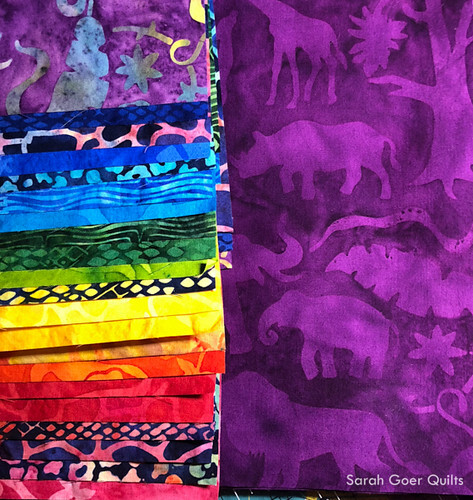 My super secret fabric bundle that's been burning a hole in my stash since February is Petting Zoo, a vibrant and colorful line full of animals and animal prints. I chose to feature the rainbow of prints in my Floating Hexagons pattern (coming very soon! -- be sure to sign up for my newsletter so you don't miss the announcement). The pattern is in three size, and this is the lap size, finishing at approximately 45" x 63". 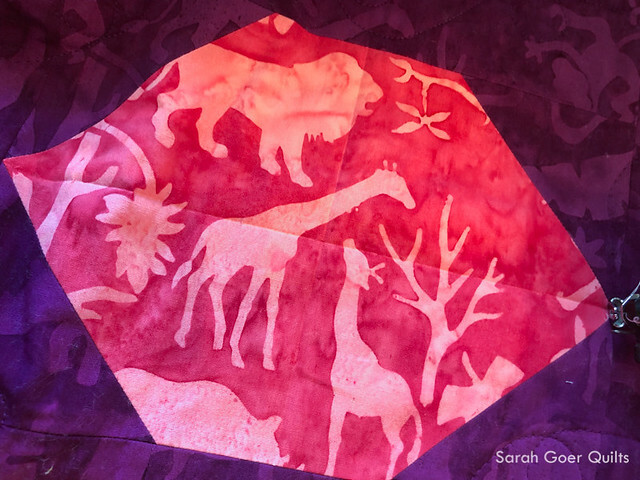 Jungle Animals in Grape Juice is my background fabric. 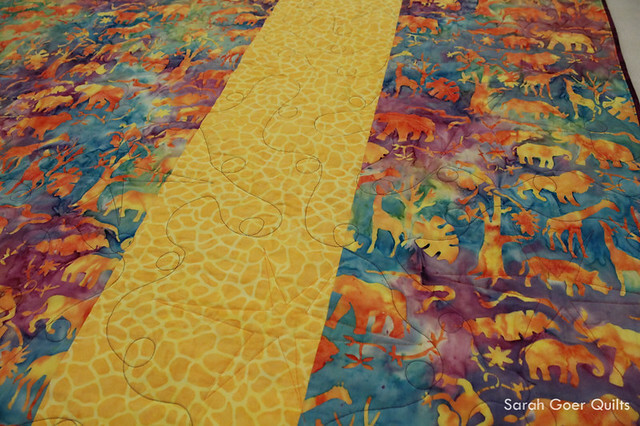 The backing is Jungle Animals in Snowcone with Giraffe in Cheddar. All of my piecing and quilting were done with 50wt Aurifil thread. 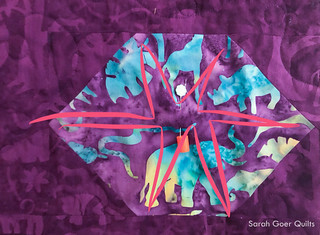 I quilted the purple background with a loopy meander. 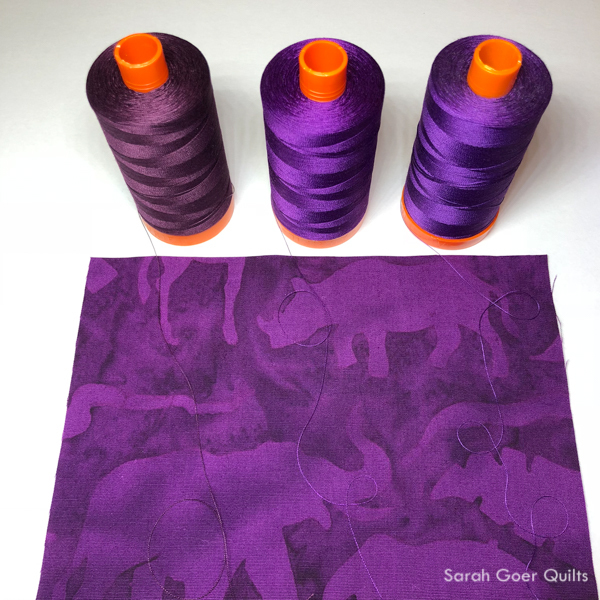 I began by auditioning three Aurifil purples. I do this by laying the thread across the fabric. 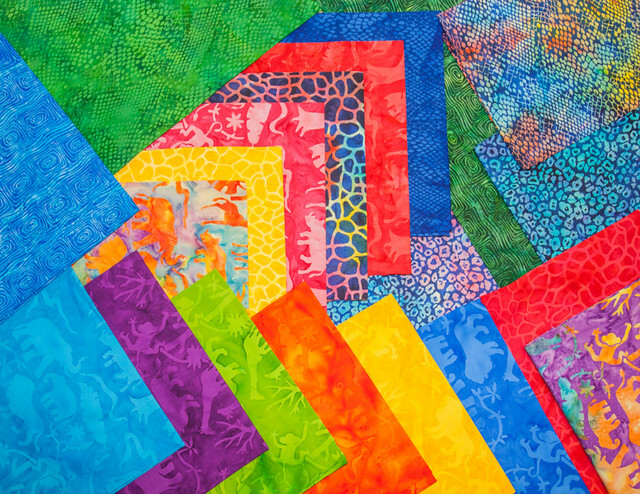 If possible, I try to mimic the pattern and density of the quilting I am planning. This technique is also helpful in considering different weight threads. I settled on Medium Purple (#2545) -- the middle one. 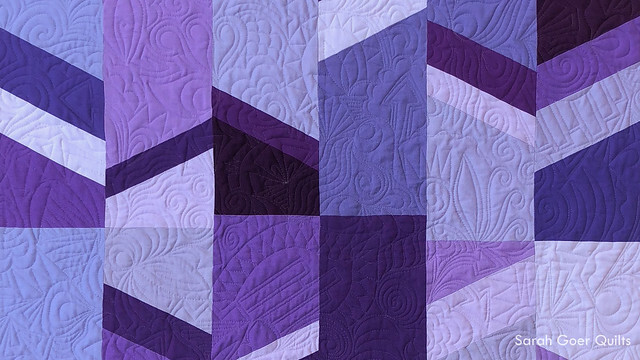 I wanted the hexagons quilted in colors that blended with each fabric and the quilting motif to contrast the loopy meander in the background. I used my phone to sketch some options for the hexagons. Here are a few I considered. 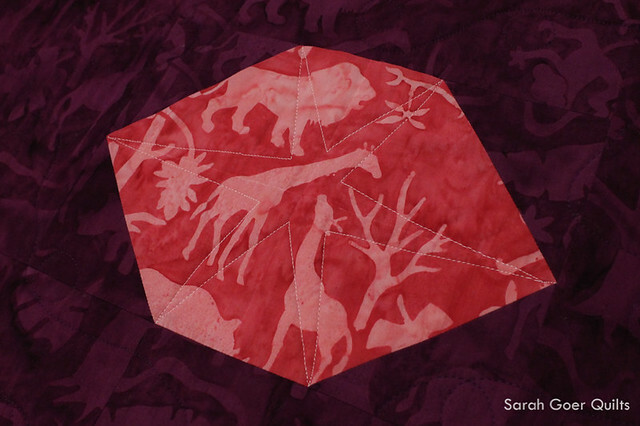 I chose the star and used my hera marker to mark the horizontal and vertical center of the hexagon to gently guide my quilting. I used quite a variety of colors in my quilting: Aurifil Desert Dawn Variegated (#4648), Yellow (#2135), Forest Green (#4026), Medium Delft Blue (#2783), Spring Green (#1231), Green (#2870), Turquoise (#2810), Dark Violet (#2582), Red (#2250), Medium Blue (#2735), Baby Pink (#2423), and Burnt Orange (#1133). (Listed roughly left to right by row, as used on the quilt.) Binding was attached using my Machine Bind Your Quilts Like a Pro technique. Here's the full view of the front and back! Thank you for visiting! Don't miss out on entering the great giveaways on many stops of the hop! ISLAND BATIK GIVEAWAY Island Batik is giving away three Strip Packs in the Rafflecopter below. See their terms and conditions. 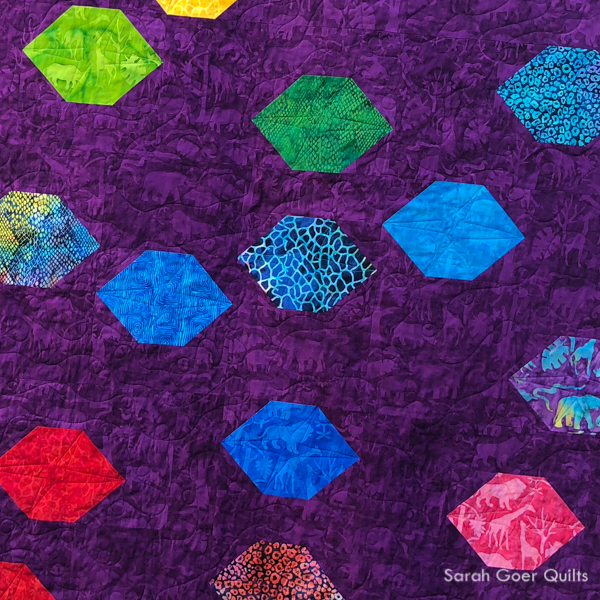 a Rafflecopt er giveaway SARAH GOER QUILTS GIVEAWAY For your chance to win a PDF copy of my Floating Hexagons pattern (in three sizes: baby, lap (shown) and throw), enter with Rafflecopter below by leaving a comment on this blog post and/or by being a newsletter subscriber. Not a newsletter subscriber yet? Subscribe here, click to confirm your subscription in the email that comes to you. At the end of the giveaway I will email the randomly selected winner and they will have 48 hours to reply to claim their prize or I will select a new winner. PDF pattern will be emailed to the confirmed winner. I'm linking up to TGIFF, Needle and Thread Thursday, and Finished or Not Friday. Posted in Quilting. 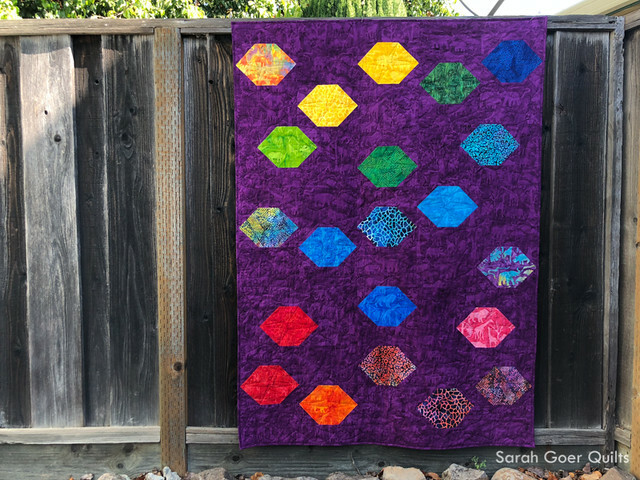 Tags: Aurifil Artisan, Aurifil thread, blog hop, finished quilt, Floating Hexagons, great outdoors blog hop, Island Batik, island batikambassador, lap quilt on August 17, 2018 by sarah.